In Stock! Orders placed today will ship in one business day. 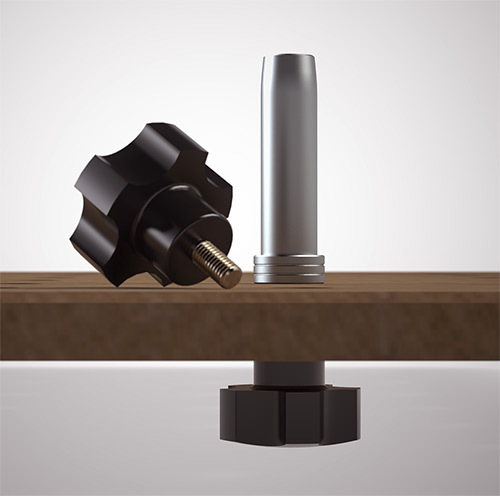 Our DoubleGroove™ Tall Dogs, Dog Rail Clips and M8 SpeedKnobs are a popular means of positioning and securing your guide rail to a 20mm worktop. While our Tall Dogs afford a maximum level of adjustability in the thickness of material you can slide underneath the guide rail and cut, there is one trade off: the Tall Dogs can interfere with the motor housing on the Festool TS55 and TS75 as they are moved along the guide rail. If you have a large enough 20mm table and don't tend to utilize the full length of your table when making cuts, you may never encounter this limitation. 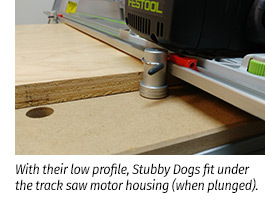 But for those using a standard Festool MFT/3 or smaller 20mm work surface, the low profile of Stubby Dogs means you can now cut along the full length of your guide rail. Stubby Dogs are recommended for cutting materials one inch (25.4mm) thick or less. Utilize them in conjunction with Dog Rail Clips and M8 SpeedKnobs to position and secure your guide rail for cutting. For thicker materials, we recommend our Tall Dogs. Tall Dog or Stubby Dog? It really comes down to the material you most frequently work with, and the overall size of your 20mm worktop. If you have the luxury of a large 20mm worktop and don't often utilize the full length of the table, our Tall Dogs afford maximum flexibility in the thickness of workpiece you can cut. 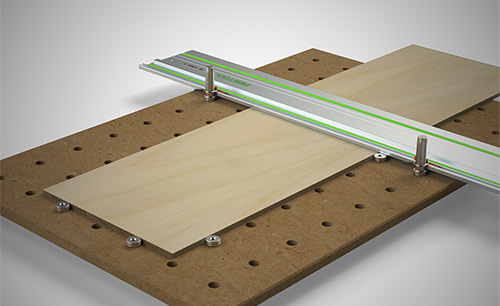 If you are using a Festool MFT/3 or smaller 20mm worktop, frequently need to utilize its full length for cuts, and typically work with sheetgoods one inch and under, Stubby Dogs let you cut along the full length of guide rail. The difference between the Tall Dog and Stubby Dog is 40mm less in body height, as you can see from the image to the right. DoubleGroove™ Stubby Dogs measure 30mm above the collar, and 18mm below the collar. This makes them the perfect size for securing your guide rail, when used in combination with Dog Rail Clips. 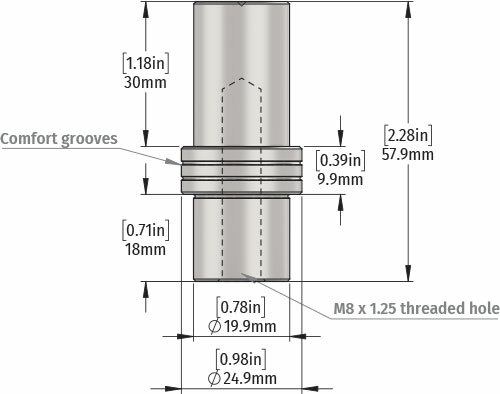 To accommodate clamping, an included M8x1.25 threaded hole at the bottom of each dog accepts our M8 SpeedKnobs™, FESTOOL® M8 knobs from the clamping elements kit, or any other similar off-the-shelf M8x1.25 threaded knob. All DoubleGroove Dogs are made in the USA from 6061-T6 aluminum on high-precision CNC machining centers and clear anodized for maximum durability. Sold in pairs. 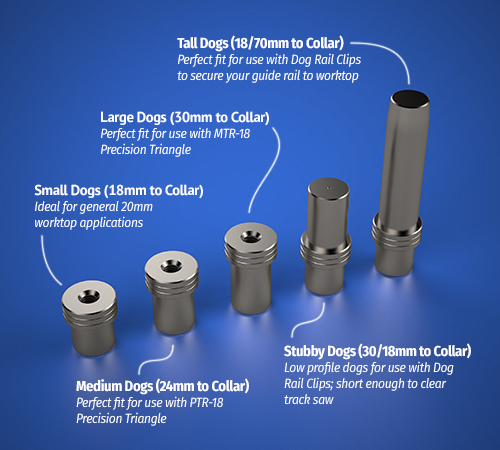 The DoubleGroove™ Dog family includes a variety of sizes: Small (ideal for most general use applications), Medium (for use with our PTR-18 Precision Triangle or thicker work surfaces), Large (for use with our MTR-18 Precision System Triangle), Tall (for using in conjunction with Dog Rail Clips to secure your guide rail to your worktop), and Stubby (the product on this page, shorter height dogs designed to be used in conjunction with Dog Rail Clips while being short enough to fit under your track saw motor housing while plunge cutting). Additionally, specialized "Close Fit" versions of our Small Dogs and Tall Dogs are available for those who want a tighter fit in 20mm worktops made with precision tools (e.g. CNC router or the Parf Guide System). Low Profile Design: Short enough to clear the TS55 or TS75 track saw motor housing when plunge cutting materials one inch (25.4mm) and under. DoubleGroove Dogs™ can be used to secure your workpiece to your perforated worktop at perfect 90 or 45 degree angles. When used in conjunction with Dog Rail Clips, our dogs can also be used to secure your guide rail to your worktop. 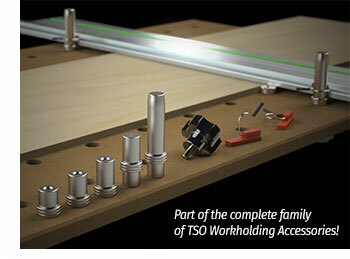 Part of a complete range of 20mm workholding accessories from TSO Products!